Konta was certainly the heavy favorite against Laura Siegemund, who was playing her first hard court match of the year, and the Brit dominated the opener and then pulled through a tight second set to win her first ever main draw match at the Connecticut Open. 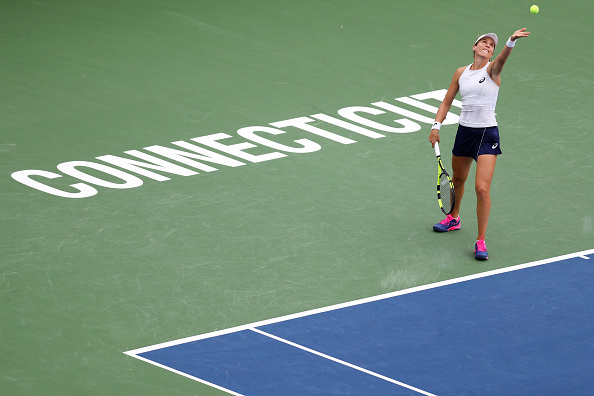 Former world number four Johanna Konta picked up a win on her main draw debut at the Connecticut Open, with the Brit defeating Laura Siegemund in straight sets in New Haven. Konta has largely struggled this season, culminating in her falling out of the top 40 in the WTA Rankings, though has shown some signs of improved form during the hard court summer, recording wins over the likes of Serena Williams and Victoria Azarenka, and was a big favorite for this match, considering this was Siegemund’s first hard court match of 2018; the German was out for nearly a year due to an injury picked up just before the French Open last year, and has played few tournaments since her return. Early on it was the Brit who was in complete control, cruising through the opening set in just half an hour, though Siegemund improved in form in the second set as she proved to be more competitive. However, Konta broke late on, and eventually sealed a 6-2, 7-5 victory in an hour and 44 minutes. The last time these two met was an incredibly tight encounter last season, with Siegemund coming from a set down to prevail on her favoured clay courts. However, in her first hard court match since Miami last year, the German was unable to pose too much of a threat to someone who feels more comfortable on this surface. It was Konta who got off to a storming start in the opening match of the day on the main stadium, breaking in the opening game and eventually storming to a 4-0 lead against the German. Siegemund was able to work herself into the set slightly after this, with two confidence-boosting service hold, though she could do little to threaten Konta, who eased to the opening set with ease. After a strong opening set, it looked as if the Brit would run away with the encounter as she broke Siegemund in the opening game of the second set, though the German fought back and broke for the first time to level up at 3-3. The German was proving a tougher challenge in the second set, though Konta still looked the most threatening, and after missing three break points at 4-4, broke at 5-5 and then saved a break point to serve out a straight set victory. Though she was not quite as dominant and clinical in the second set, it was undoubtedly another solid win for Konta, who struck 22 winners on her way to securing victory today. The Brit will have a very tricky second round match next, with former world number six Carla Suarez Navarro waiting.